Scramblers—scramblers everywhere. That’s the zeitgeist of the current scene…and BMW have just entered the fray in spectacular fashion. 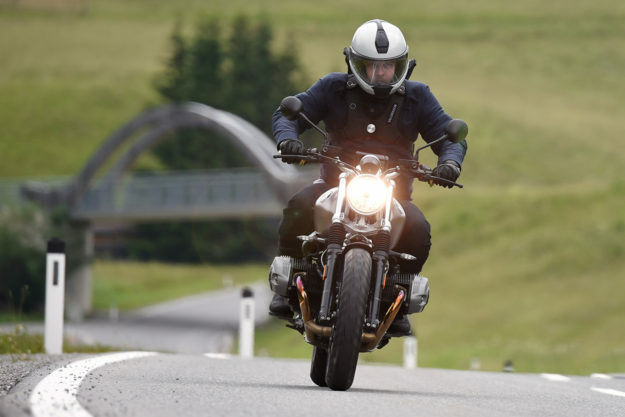 The new BMW R nineT Scrambler is a bike we saw coming a mile off. The first clue was the Concept Path22: a customized R nineT revealed at last year’s Wheels & Waves fest, with a 19” front wheel, a surfboard rack and artwork by Ornamental Conifer. 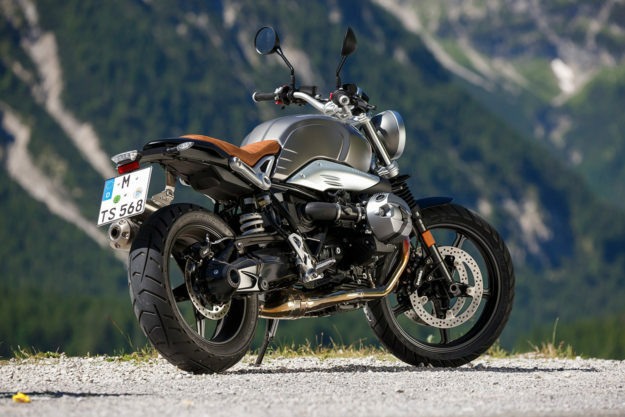 When the official R nineT Scrambler finally broke cover, our suspicions were confirmed: we’d been looking at it all along, hidden under a thin veil of fancy bits and eye-catching graphics. That BMW would eventually expand the R nineT range (officially filed under ‘Heritage’) was a no-brainer. The R nineT is a highly capable bike, that’ll give any other modern classic a serious run for its money in both performance and aesthetics. But it’s priced at a premium. 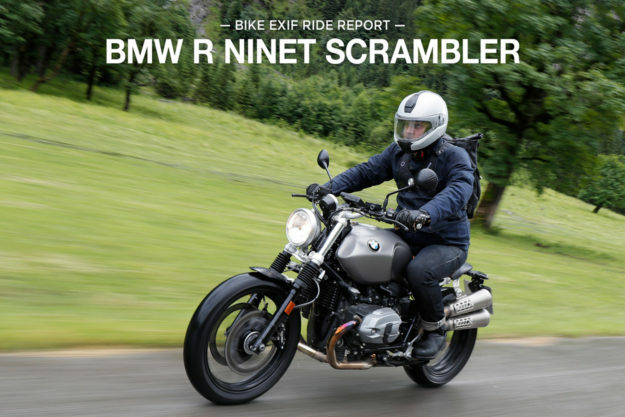 So the Bavarian marque’s mission was twofold: scramble the R nineT, and make it cheaper. 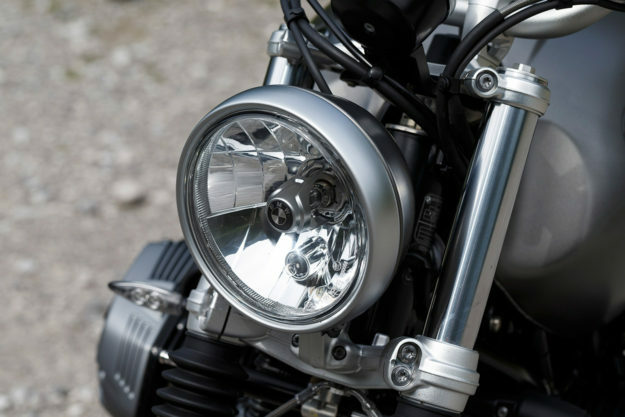 Under the hood The R nineT Scrambler packs the same DNA as the R nineT—starting with its air-and-oil-cooled, 1170cc boxer engine. BMW have the newer, liquid-cooled boxer motor at their disposal, but ultimately decided that it’s too modern for their ‘Heritage’ bikes. The old airhead is now Euro4 compliant, thanks to a team of engineers slaving away in white lab coats. Somehow, it still makes the same 110hp as its predecessor, and only 3Nm less torque at 116Nm. (For the geeks here, those figures are at 7,750rpm and 6,000rpm respectively). NB. 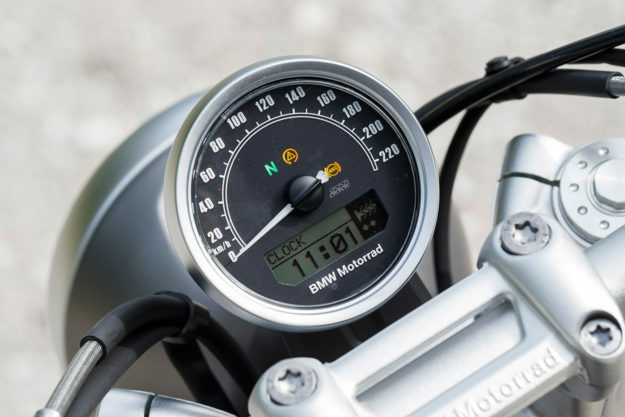 It’s worth noting that the R nineT Roadster is still only Euro3 compliant. No news on whether BMW will be upgrading the existing model. The differences Purists will say that a motorcycle has to have impeccable off-road manners to bear the ‘scrambler‘ label—and will simultaneously complain that it’s an overused term. But BMW weren’t aiming for dirt-shredding capability here. They have their GS range for that. Instead, they set out to capture an ‘off the beaten track’ vibe—an upright, agile and robust bike with an air of approachability. It seems like a skin-deep styling exercise, but the list of changes is actually pretty lengthy. The most obvious one is the wheels: they’re narrower than before, with a bump in size up front to 19”. And they’re cast aluminum units—a cheaper option than laced wheels, with a retro, five-spoke design similar to those on Roland Sand’s Concept 90. Another cost cutting part is the fuel tank. 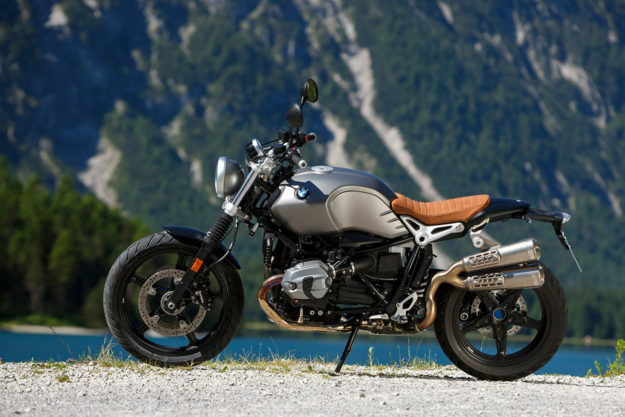 It’s the exact same shape as the R nineT’s (making it interchangeable), but it’s made from steel rather than aluminum. The seat’s a synthetic affair, with a worn leather look. At a distance it looks custom and hand-made—but up close you’ll notice that the horizontal lines are embossed, not stitched (another move towards keeping the price down). The Scrambler comes with a two-up seat, but our test bikes were kitted with a solo, aftermarket option. The frame’s a little different too—BMW have steepened the steering head angle to compensate for the bigger wheel. The rear part of the subframe is no longer removable (as it is on the R nineT), but the passenger support section still is. Conventional forks replace the USD units on the R nineT, and there’s more suspension travel at both ends (5mm up front and 20mm out back). 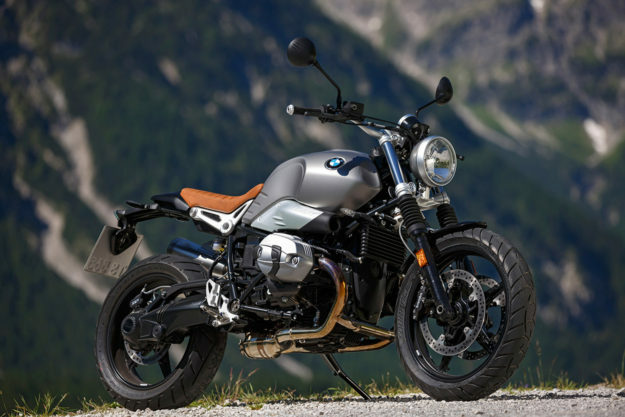 The ergonomics have been tweaked too: the pegs are lower and further back, the seat is taller, and the handlebars—though the same as the R nineT’s—are placed higher than before. Finishing touches include fork gaiters, GS foot pegs (with removable rubbers) and a neat single dial. Sure, there’s no rev counter or gear position indicator, but the design is so tidy that you’re unlikely to want something smaller. 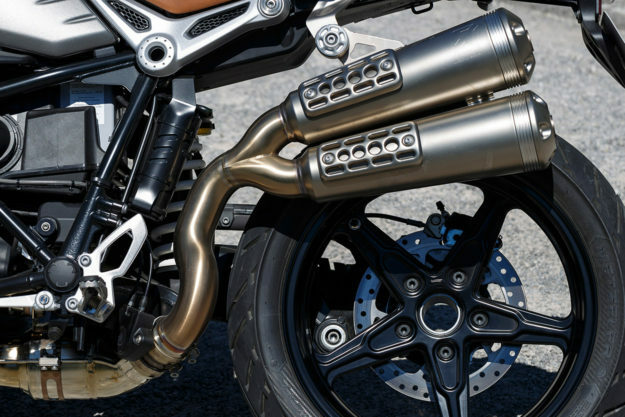 Then there’s the exhaust: a high-riding system from Akrapovič that’s long enough to meet regulations, but stout enough to look just right. The look is reminiscent of SuperTrapp mufflers (note the rings near the ends), with neat little heat shields bolted on. 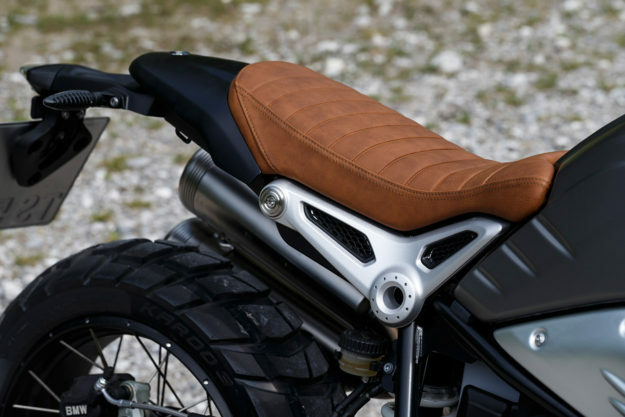 The Scrambler’s available in any color you want, as long as it’s matte grey (or ‘Monolith’ grey, as the catalog reads). Lead designer Harry Schmidt notes that he picked the color for its honest and tough nature—it should take a knock, and wears scuffs and scratches well. Areas like the swingarm and fenders are finished in black, to keep the bike looking as compact as possible. Park it next to the R nineT, and the sum of all these changes is immediately evident. 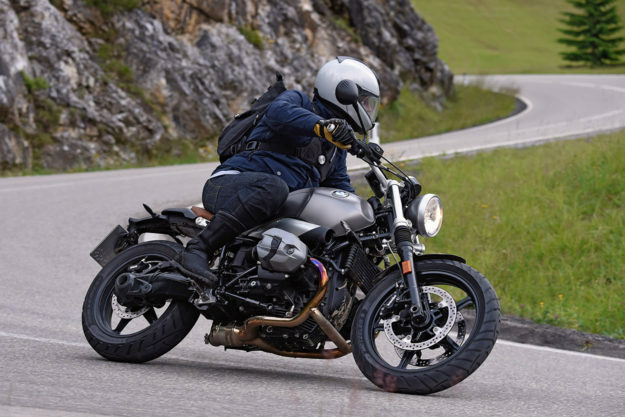 The R nineT is squat and purposeful; the Scrambler is tall and playful. The former’s a white collar exec, while the latter is decidedly blue collar—greasy fingernails and all.